Aarhus Canal is crossed by bridges and lined with restaurants and bars. Aarhus is Denmark’s second biggest city, second to Copenhagen. Aarhus is a city with many faces. Aarhus has industrial areas around the harbor and train station, a shopping and dining area along the canal, a city center with historic buildings, and one of Denmark's prettiest street. When planning our travels to Denmark, I had a hard time deciding if we should visit Aarhus or not. We were already going to Copenhagen and I didn’t know if we really needed to visit another big city, as I was more interested in quaint towns and pretty countryside. Aarhus’ most well-known site is ARoS Aarhus Kunstmuseum of contemporary art, which is not always my favorite. But I had this nagging feeling that if we skipped Aarhus we might be missing out. Now I know we made the right decision adding Aarhus to our Denmark itinerary. If you’re wondering what there is to do in Aarhus, here are our favorites. The colorful half-timbered buildings of Den Gamle By. Den Gamle By was the world’s first open-air museum for urban history and culture when it opened in 1909. Den Gamle By is a collection of homes rescued from various towns across Denmark and brought together in Aarhus. The homes are grouped into time periods. The largest section portrays the 1700s and 1800s, though it does contain buildings going back to the 1500s. A smaller section portrays 1927, another 1974, and a final section is currently being constructed to represent 2011 through 2014. Den Gamle By's brewers make and serve their beer at the Den Gamle By brewery. Den Gamle By's Mayor's House and Mintmaster's Mansion. Plan to spend no less than three hours in Den Gamle By, but a half-day or more is far better. Be sure to buy a guidebook with your ticket. Aarhus Cathedral is Denmark's longest church. Aarhus has a special cathedral, Aarhus Domkirke. Aarhus Cathedral was started in the 12th Century and was completed in 1350. Aarhus Cathedral is the longest church in Denmark, at 93 meters. The largest of Aarhus Cathedral's uncovered frescoes. But what makes Aarhus Cathedral really special is its frescoes. At one time many of Denmark’s churches were decorated with frescoes. But then the Reformation happened and all frescoes were whitewashed over. Aarhus Cathedral’s frescoes were painted between 1470 and 1520, except for one which was painted in the 1300s, and the Reformation hit just 16 years after the frescoes were completed. Of all the churches in Denmark to which this happened, Aarhus Cathedral has the largest total area of walls and arches covered by frescoes which have been uncovered and are incredibly well-preserved. One fresco representing St. Christopher and St. Clement is the largest in Denmark at 220 square meters. Aarhus Cathedral's Votive Ship "Unity." Another special feature in Aarhus Cathedral is the Votive Ship “Unity.” Ships hang from the ceilings in many Denmark churches. According to the Aarhus Cathedral website these ships “symbolize man’s ‘navigation’ from cradle to grave.” The Votive Ship “Unity” dates back to the early 1700s and was created as a model in Holland and was shipped to the Russian Tsar. The ship carrying the model was wrecked at sea, but the model drifted to shore practically undamaged. The ship was purchased at auction by some fishermen from Aarhus and donated to Aarhus Cathedral. It is the largest votive ship in any church in Denmark. Mollestien looks like no other street in Aarhus. Mollestien will only take a few minutes to visit, but should definitely not be missed. Mollestien is the prettiest street in Aarhus. Mollestien is a cobblestoned street bordered by pastel homes built in the 1700s. While walking down the street keep a lookout for “street spies” like the one seen on the blue house above. These mirrors are used by homeowners to see what is going on outside from inside their homes. An illustration of Roy G. Biv in Olafur Eliasson's Your Rainbow Panorama. ARoS Aarhus Kunstmuseum is one of Europe’s largest art museums and exhibits contemporary art. While I wasn’t a big fan of the Louisiana Museum of Modern Art, I hoped I would enjoy ARoS more because it features contemporary art, including installation art, which is one of my favorite art forms. More than that, it has works from one of my favorite contemporary artists, Danish-Icelandic artist Olafur Eliasson. ARoS’ nine floors are inspired by Dante’s The Divine Comedy. The entrance is on the fourth floor, and visitors can either climb upwards towards heaven or downwards towards hell. On the top of ARoS is Your Rainbow Panorama, a large circular walkway on the roof of the building enclosed by glass of every color of the rainbow. The lowest level contains nine spaces reserved for international light, video and installation art and represents the journey through the nine circles of hell. The detail of Ron Mueck's Boy is astonishing, down to the fine blood vessels under the skin. One of ARoS’ famous pieces is Boy created by Ron Mueck in 1999. Boy is a hyper-realistic sculpture of a boy that is 4.5 meters high. The details are vivid, such as the rough elbows, individual hairs, and skin texture and color. Vikings are a huge part of Denmark’s history and there are quite a few Viking museums throughout Denmark. Aarhus’ Viking museum, or Vikingemuseum, is just a small room in the basement of Nordea Bank. The reason for its location is that the discoveries exhibited in the museum were made on the very site where the building now stands. The Viking Museum is part of Moesgaard Museum (home to a bog man which we were unfortunately unable to visit since they were in the process of moving Moesgaard Museum to a new site). In the 1960s Moesgaard Museum had archaeologists excavate the area. They found part of a Viking town three meters below street level. The remains include houses, wells, fences, tools, and pottery. They even found the makings of a murder mystery, a headless skeleton. During World War II, from 1940 to 1945, Aarhus was occupied by the Germans. Aarhus’ Occupation Museum (Besættelsesmuseeti Århus 1940-45) illustrates what was happening in Aarhus during the German occupation using original objects, photos, and documents. While there were a lot of bad times, not everything in the museum is about unhappiness. There are also displays of daily life, Danish humor, nationalism, and actions made by the Danish resistance. The museum is located in the cellar of the building that served as Aarhus’ Town Hall from 1857 to 1941 and then as a police station from 1941 through 1983. Starting in November 1944 it was Gestapo headquarters. Villa Provence's courtyard, perfect for enjoying a glass of wine. We stayed in quite an array of hotels while in Denmark. In Copenhagen we stayed in a hotel that used to be lodging for sailors. In Ribe we stayed in a holiday home. In Roskilde we stayed in one of Denmark’s oldest hotels which had been visited by Hans Christian Andersen. Our hotel in Aarhus was like a villa straight from Provence. In fact, this boutique Aarhus hotel owned by Annette and Steen Stenstrup is called Villa Provence and is meant to evoke all things French. Our Provencal style room at Villa Provence. Villa Provence has 39 individually decorated rooms furnished in Provencal style. Rooms are beautiful and roomy with wood floors, comfortable beds, and seating areas. The rooms surround a cobblestoned courtyard with a fountain, citrus trees, and tables and chairs perfect for enjoying a glass of French wine. The courtyard was decorated by floral artist Tage Andersen. Not only does Villa Provence provide guests with charming rooms and a relaxing courtyard, guests also can enjoy one of the best hotel breakfasts I’ve ever experienced with orange juice freshly squeezed every morning, yogurt with honey, cheese, fresh fruit, and charcuterie. We made the mistake of sleeping in past breakfast the first morning. Don’t make that mistake. Disclosure: Villa Provence provided us with a media rate for our stay. Our favorite restaurant in Aarhus was Kähler Spisesalon. Interestingly Kähler is not first a restaurant, but a ceramics company. In the restaurant guests are not only served delicious food but are also surrounded by beautiful pottery. The food is traditional Danish with a modern twist. A surprising find for lunch was A Hereford Beefstouw. I was unsure at first because the restaurant is a chain, but we went because Sct. Clemens Brewery had merged with A Hereford Beefstouw, and we were there for the local beer. The fact that A Hereford Beefstouw is a chain should not have concerned me because our lunch was fantastic. The restaurant is known for their steak, but since it was lunchtime I ordered the lunch plate, which was a mix of small portions of salmon, sausage, roast beef, and cheese. The beer was excellent too. A lunch plate at A Hereford Beefstouw. 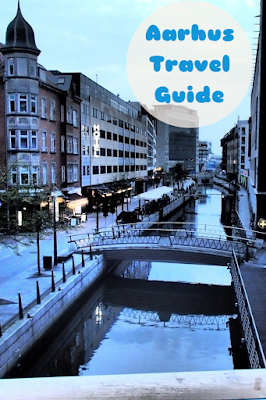 If you are just looking for a snack or drink, the Aarhus Canal is the place to go. The river that runs through town was once covered by concrete. But the concrete has since been removed and restaurants and bars now line the water. The most popular menu items at these restaurants appeared to be hamburgers and nachos, which was a little surprising. But the outdoor tables are a great place to sit, have a snack, and drink a Carlsberg. Nearby are a number of shops including Denmark’s department store Magasin Du Nord. Aarhus Canal, the perfect place to relax and sip a Carlsberg. We almost skipped visiting Aarhus, but I am so glad we included Aarhus in our Denmark itinerary. While it is a big city, it is completely different from Copenhagen and the things to do in Aarhus are varied and interesting. Two nights was the perfect amount of time for us to enjoy what there is to do in Aarhus.